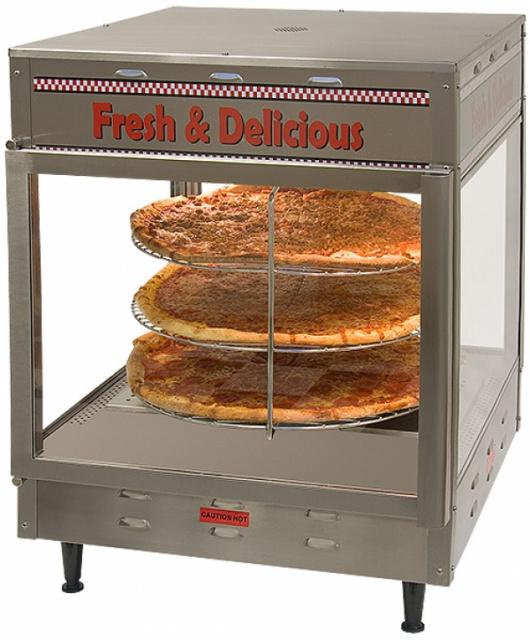 Benchmark USA Humidified and Heated Pizza Display Warmer that holds up to 18" Size Pizzas. The rotating racks will stop automatically when either the front or rear door is opened making it ideal for either front or back counter applications. Each display warmer comes with an easily interchangeable, 3-tiered, pan rack and hook rack for any application. The stainless steel food-zone and cabinet insure years of durability while the 4” legs provide for easy under cabinet cleaning. The temperature readout and adjustable thermostat allow for perfect holding temperatures of any food products. These display warmers come with attractive graphics and a three-year warranty. To keep current of our new concession and Holiday products at Standard Concession Supply, as well as our monthly promotions and discounts, please enter your email below and click on the "Subscribe" button. Once you click subscribe, you will receive an email in which you will need to respond by clicking the confirm link in that email. Otherwise, you will not be receiving our newsletter until this is completed.